"Love is a link that connects a force that attracts, a fascination that seizes, and a clasp that graps. Therefore, when one establishes himself in the relationship of devotion with the divine he steps up into a realm of his own, having his own enchantments and personal experiences." 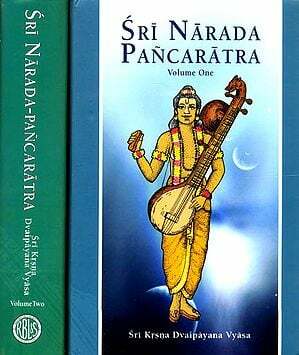 Swami Chinmayananda's commentary on Narada Bhakti Sutra dances with the nuances of an ecstatic and enduring relationship with the Lord of one's heart that becomes the bed-rock of a devotee's life. This Divine Love is all- consuming, yet purging and freeing in its impact. The devotee trusts the Lord like a friend, cherishes Him like a child and is faithful to Himlike a wife. Where than is the need or the place for any other worldly relationship? joy Or sorrrow, it is the Lord alone for him. He will play, pray, fight and frolic only with the Lord in his heart's shrine. Get engulfed by an affair that lasts lifetimes, riding on waves and giant waves of beatific beauty! The declarations of the Upanishads are called Mantras; they are "statements that are to be reflected upon, whereby the individual comes to feel inspired and uplifted." 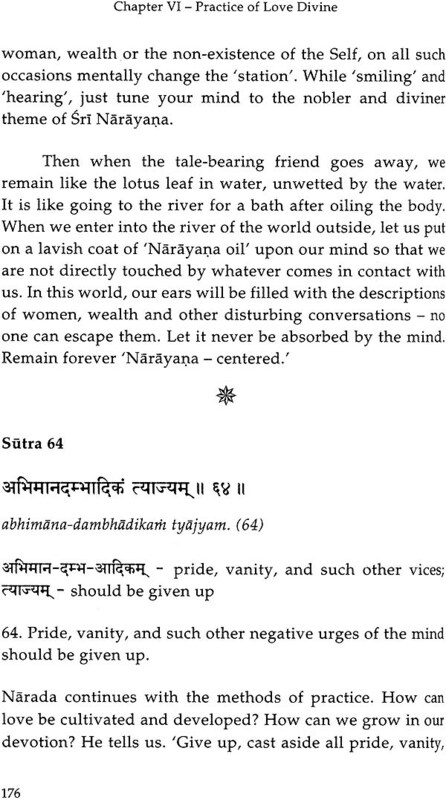 All our philosophical textbooks are written out by the great seers and thinker in the form of Sutras. The term, 'Sutra', means 'string'  the string on which the arguments and thoughts are strung together to become an enchanting garland of ideas. Sutras are explanatory statement, and in their depths, they are also exploratory in their functions. The philosopher's job is not only to explain things but also to explore the possibilities of wiser ways of living and to bring to the recognition of the student the greater wisdom, equipped with which he can become more efficient in his life. He helps Dhruva; protect Prahlada's Mother; advises Kamsa to kill the children of Dezvaki; persuades Ravana to get himself entangled on Bali's tail!! He plays upon the weaknesses of the devotees and makes them suffer and in the resultant effect of catharsis, the students become free from all their weaknesses and march more deliberately towards their spiritual goal. The very name, Narada, indicate that he is "one who gives knowledge of the Supreme Brahman". 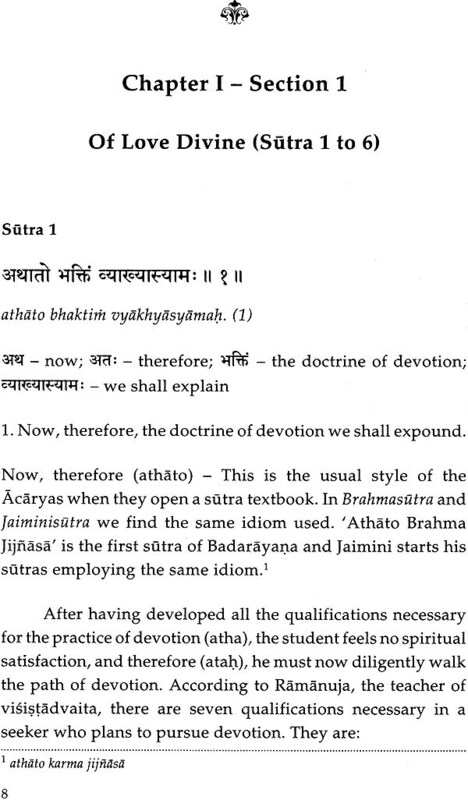 All the Six Schools of Philosophy (Darshanas) in India are given out in the form of Sutra. Besides we have the Brahma Sutras expounding the Advaita philosophy, and the Jaimini Sutras explaining the ritualistic portion of the Vedas, and thus propounding the Karma philosophy. The Sutras are terse sayings pregnant with deep significances and the ample suggestions. Here we have an authoritative textbook upon the philosophy of Devotion, in eighty-four Sutras, and we read it in the Bhagavat. 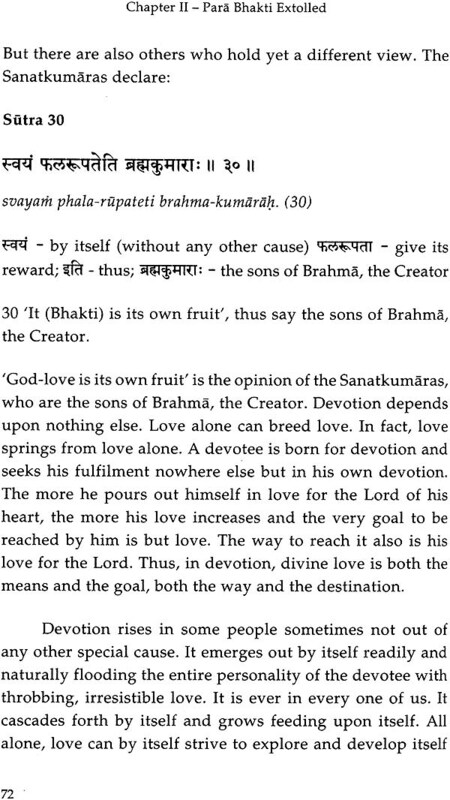 This philosophy of love for God stands today attributed to the famous Devarishi Narada whose personality is very familiar throughout the Puranas. He works everywhere as friend, philosopher and guide, to all devotees. Even if he is not specially invoked, it is his job to propagate the Path of Love, and therefore, he appears of his own accord to guide devotees of the Lord. He helps Dhruva; protects Prahlada's Mother; advises Kamsa to kill the children of Devaki; persuades Ravana to get himself entangled on Bali's tail!! He plays upon the weaknesses of the devotees and makes them suffer, and in the resultant effect of catharsis, the students become free from all their weaknesses and march more deliberately towards their spiritual goal. The very name, Narada, indicate that he is "one who gives knowledge of the Supreme Brahman". Narada is described in the Vedas as one of the sons of the Creator, who Himself taught the spiritual Truth to his four sons, the Sanatkumaras, and the young the spiritual Truth to his four sons, the Sanatkumaras, and the young boy had his initiation into Vedanta at the very hands of his brothers. However, Narada instinctively took to the Love of Vishnu; he refused to marry and took himself to a perpetual vow of Brahmacharya. He was 'born', naturally, in the various realms according to his Vasanas. He became a Gandharva  a Celestial Being devoted to music  and yet, he could not escape from the sensual desires, and he wandered through the Universe in perennial youth and beauty, devoted to the soul of music. Time and again he fell for the infatuations of the senses. Yet, he purused diligently his devotional music and made all his listeners feel its divine ecstasy and joy. It is said that it was Narada who invented the most perfect musical instrument, Veena. While once watching the dance of Rambha he was filled with passion and his Father ordered him to be born as a Sudra in the world. Since he had thus to come into the world and live, he gathered therein experiences, which made him all the more fit for his work, for, he could always fully sympathise with the passions and weaknesses of other human beings. When Narada was born in the world, his Father was Kashyapa, son of Mareechi, according to the Vishnu Purana; but according to the Rig Veda, his Father was Kanva, the Sage who brought up Shakuntala in the forest; but in both cases his mother was a Sudra, a servant girl. This devoted lady was working in a family where Rishis used to visit frequently. Once for the "four months Vrata" (Chaturmasya), a team of great Rishis stayed in the family, and the boy became their pet. He served them with all devotion and ate the food that they gave him. He thus became purified, and the Seers blessed him. This young devotee lost his Mother soon after and thus became free to move about in the world singing the Glory of the Lord and spreading the message of Narayana everywhere. We find Narada skipping across the din and roar of the Ramayana as well as across the ecstatic music of the Bhagavata. To0 this great advocate of love and devotion is attributed these aphorisms upon the philosophy of Devotion, the Bhakti Sutras. 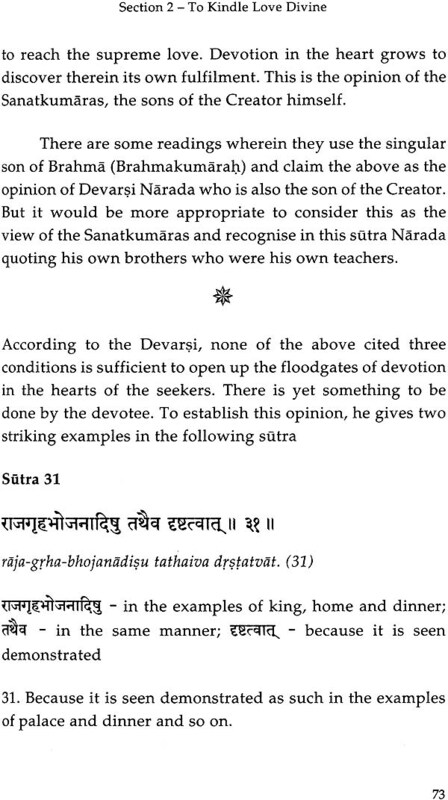 There is no evidence to prove that Narada actually wrote out these Sutras; whoever be the author of these eighty-four sutras, they are rightly dedicated to this Champion of Devotion, Devarishi Narada. 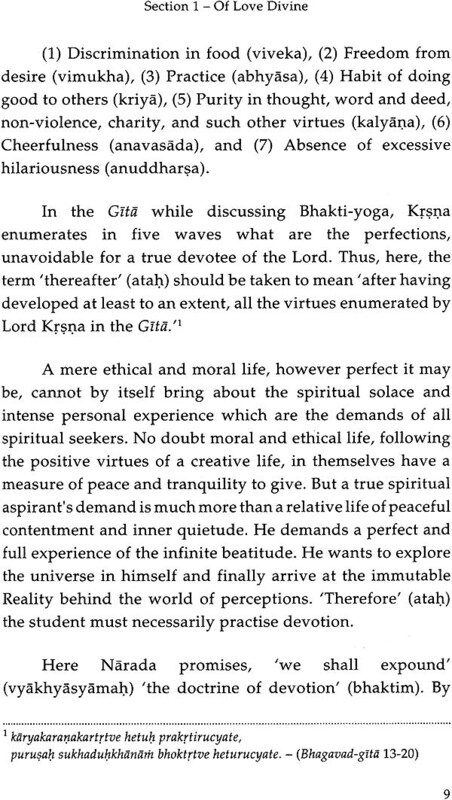 An extremely fallacious criticism, which we find generally leveled against Vedanta by its hasty students from the West, is that there is no Personal God in Hinduism. In this we cannot blame the Western Scholars, because, in India, during and after Sri Sankara's time, there has been an over emphasis upon the Vedantic thoughts. Vedanta indicates the Transcendental Reality, which is experienced through logical reasoning and subtle meditation. In this Path of Knowledge there is no insistence of a Personal-God and our devotion to Him. Thereby, to decry that Hinduism recognizes no Personal God would be extremely wrong. The Path of Devotion runs through the entire spiritual traditions of the Aryans as a glimmering stream of golden effulgence, panting in ecstasy, singing in joy and weeping with satisfaction. 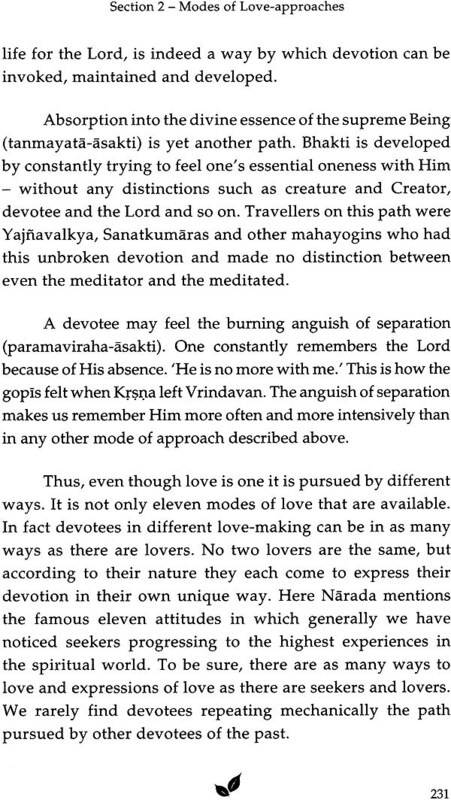 The entire Puranic literature is ever aglow with the emotion of love for the Lord. In the Geeta we have a beautiful reconciliation of devotion (Bhakti) to the Personal God and contemplation (Gyana) upon the transcendental Truth; the Geeta Acharya concludes that whichever path a devotee may follow, ultimately he will reach Me; only let him bring his entire personality to Me. We have a traditional story where Narada meets Vyasa on the banks of Saraswati, when Narada makes Vyasa accept the idea that to pursue the Path of Knowledge, alone is dry and sapless, and that without Devotion for the Lord and His Glories, spiritual seeking is joyless. 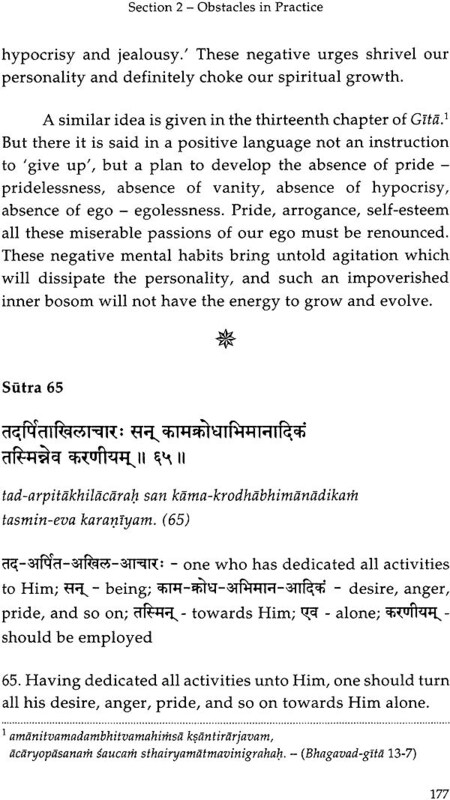 Vyasa accepts the idea and undertakes to write the great Bhagavatam. In the light of these information upon the personality of Narada it becomes evidently clear that even though he might not have personally taken up his pen to write these aphorisms, it is only right that to Narada alone must these Sutras be dedicated by us. As the greatest Champion of the Path of Devotion, again, this eternal devotee of Narayana, Devarishi Narada, alone can be the best Teacher to instruct us in the Philosophy of Love. May we discover this Love Divine in ourselves. May we find the courage in ourselves to live this Divine Love. May we come to explore the fulfillment of this Love Divine. I must acknowledge the help given by Brahmacharini Kanta Devi (Concha Hughes of Honolulu) in preparing the manuscripts and the English versification of the Sutras have been done by Brahmacharini Sarada Devi. They both deserve our gratitude. Chinmaya Prakashan delightfully presents a revised and revamped edition of Pujya Gurudev's commentary on Narada Bhakti Sutra - the aphorisms on Divine Love! It places on record the contribution of the Chinmaya Sampadan and Kalpanam teams which helped in the making of this book. It takes one sage to understand another and unravel the subtleties of his work. Pujya Gurudev has done us this sacred favour in explaining Narada Bhakti Sutra! Let us take maximum advantage of this service of his to us.